This morning my ear feels cauliflowered. After being on hold for over an hour with the Social Security folks, I believe that I have someone new to be disgusted with. Yes, I took it personal. Helps a lot, doesn’t it? Right. First disgust is that they want me to drive to the nearest Social Security office to get my card. That is five hours of driving (back and forth between Texhoma and Pampa, Texas) and no telling how long you would wait at the office. So, it would entail taking a day off work. Another day. I don’t think that’s likely. So, I can send in my application and a form of ID. That could be my driver’s license or my passport. But not a copy of them. So, I could either be driving illegal till the people that have you on hold for over an hour get your license back or I can send my passport. Which I’m sure Homeland Security loves that going on. At this point I’m thinking these folks are the monsters that we used to imagine under our bed. So, enough of the soap box. Speaking of monsters, if your kids are scared of monsters in their room when they go to bed (or whenever), just get a can of spray disinfectant and tape a paper that says MONSTER DESTROYER on it and go for those monsters. Nothing like being a hero. You can kill monsters and germs at the same time. Main Street Guymon’s awards banquet (actually more of a party than a dress up banquet) is on Feb. 18at 6 pm. Would love to have you come. We honor those who have done exceptional things the past year and we love giving back to many of our volunteers. Tickets are $25 and it’s great Virgil Gibson food! And I promise you’ll be out before 7:30 pm. Come by the office and get a ticket or buy one at the door. We’d love to see you there. In January we had the Cash Mob at Wirtz Lumber. It was a great shop and the mobsters had lots of fun. You should consider becoming a mobster. If you need a little retail therapy (you will need some sort of therapy after dealing with the social security people, I promise), join us! Support shopping local. 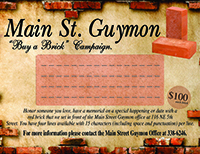 Support Main Street Guymon members. Support having fun! After the shop at Wirtz, my mind was all full of the fun and what I’d gotten and the laughing and …. And ….. well, at the stop sign, I just didn’t stop. But the car that had the right of way did. Good going for them! What a ditz I am. No wonder I can’t let my license go in the mail to those Social Security folks! I certainly may need it with the way I drive! I might not always be so lucky to pull out in front of a driver who is paying attention. And for everyone, “If God sends you down a stony path, may He give you strong shoes.” And if he doesn’t, you can buy some when we cash mob!